How to write a Personal Statement or Statement of Purpose? Many people do not know how to write the personal statements. They do not know what is the personal statement or statement of purpose and how they can write the personal statement. It is also called the statement. We will tell you in the easy and simple words about the personal statement as the personal statement or statement of purpose is added with the introduction, bio, your achievements, educational background and your interest in participating in any particular program. You can also describe the things in about 250 to 300 words. 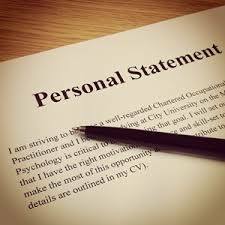 You should write the personal statement in simple and easy English, which can be easy to understand. There are many people, who write their personal statement in advanced English. The writing of the personal statement depends on program requirement that how many words you want to write. Now we will come to the side how to write the personal statement or the statement of purpose. You need to have a look at the cover letter and recommendation letter. Do not waste your time in thinking and writing like ‘My name is XYZ and I am studying at XYZ. I am in 3rd year and I am studying at the XYZ university etc. Below are the few points that help you in starting and writing the personal statement or the statement of purpose. The biggest thing is what is your interest in the course and start writing as to why you choose it? Come to the point quickly, which will be best personal statement. You need to start with short sentence to get the reason why you are interested in studying area; you are applying for and communicate your enthusiasm for it. Why you are exciting to study this course? In the opening, you need to introduce yourself and explain the motivation for study in the course and demonstrate the understanding of it. Start writing showing your enthusiasm to know about. Write, which comes naturally in your mind. What do you want to study and why they are present in the first two sentences. Show your excitement about the course and what do you want to learn about it? You need to be specific from first line. Talk about you and your enthusiasm for subject from its start. In the opening paragraph, you should show that you know what you are going to apply. Do not say that you want to study something because it is interesting. You need to explain what you find interesting in it. Do not give long introduction, you need to concentrate on main content of the statement and write introduction last. The best statement should be genuine and specific from its beginning. You will be on the right track if you explain the enthusiasm for subject or course, your understanding and what you want to achieve from it. Your Personal Statement should be in 3 to 4 paragraphs. I hope that you understood the Personal Statement or Statement of Purpose and now you know how to write the Personal Statement and you can make your own. There are few of the samples of the personal statement and some other samples of the personal statement experts. I hope this will help you and if there are some of the questions in your mind, kindly ask in the comments and we will help you in providing their answers.